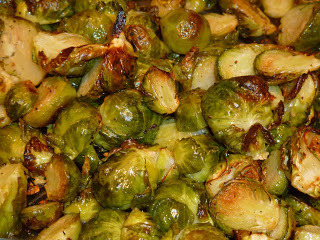 Browse: Home / 2011 / October / 15 / Roasted Brussels Sprouts Are Back!!!! Roasted Brussels Sprouts Are Back!!!! I’m just so excited about this! Most people start to get grumpy and lethargic as summer comes to an end and the Northern winds arrive. I’m amped. To me, Fall is about the produce, the hearty flavors and longer cooking processes and hearty vegetables, squash, pumpkin, carrots and best of all, brussel sprouts. While living in Arizona, I’d come home for the holidays, I’d… ok, I’d freeze most of all. My blood was thin. But once properly layered in over the top and seriously outdated snow attire, I’d go grocery shopping with my mom. “What do you want?” She’d ask. “Uhhh, vegetables,” I was on a real vegetable kick in those days (worse than now, if that’s even possible). We’d get these amazing roasted brussels sprouts from Metropolitan Market; oh Lord bless that store and their overpriced deli vegetables. I think I bough them once without my mom and quickly realized they were $7.99/Lb; too rich for my thin blood. The nice thing about roasting something in the oven is that it’s minimal hands-on cooking time. I usually get inspired at 8am on a Saturday. 1) Set your oven to 450*F; in a large roasting pan toss all ingredients together and cover with foil. 2) Roast for 20 minutes covered, then remove foil and stir. The sprouts should be pierced with a fork but still tough. Roast uncovered for an additional 20 minutes. 3) Now a fork should easily cut through the sprout and some leaves will be blackened. Taste and adjust salt/pepper. Mmmm pure bliss. Roasted brussels sprouts are my FAVORITE. Love your blog, lady. Thanks Katie! Heart you girl!